It’s Friday! That means drinks and non-stop dancing! When going out you usually want to make a statement. That can be with your outfit, your hair, and makeup, GIRL even the way you walk can make a statement, but this time I chose to use my accessories as statement pieces. This week? 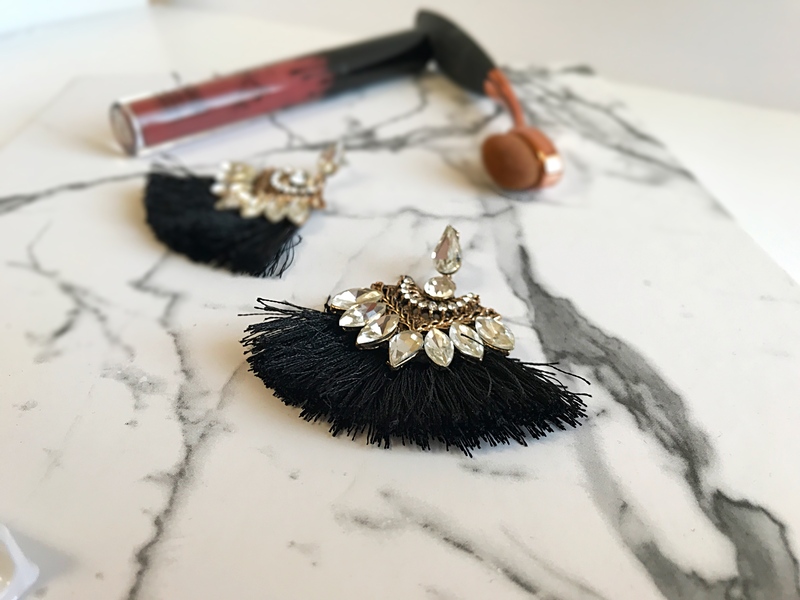 Dangling fringe earrings. Dangling earrings aren’t my typical accessory choice because I can’t deal with anything touching me around my neck so studs are my best friends but these babies caught my attention. I was invited to a Social Media (SoMe) Influencer Brunch a few weeks ago which allowed us to set up potential collabs and meet people in the SoMe world. There also was amazing food and awesome vendors; one of those vendors was Shop Style by Ale, and no this is NOT a sponsored post, I truly love these earrings! These black fringe earrings caught my eye the moment I stopped at her table. I loved the bling and the neutrality of the color, I felt like it was subtle enough that it could get lost in my hair but the gems brought enough attention that you knew Lipstick and Vodka had arrived. I can’t stop obsessing over this piece. I always thought you had to wear dangling earring when you had a slick back pony because how is anyone going to find your earrings behind tons of hair! But there is a way! They’re so stunning that anyone can spot them through my chaotic lion mane but it doesn’t cause a traffic accident. You get me? I’ve worn mine non-stop since I bought them and I always receive compliments when I wear them. I just had to let everyone know how in love I am with these. If you can get your hands on these earrings or can find something similar, I, 100 percent, encourage you to buy them! I have to see how they hold up against all the drinking, sweating, men meetings and dancing that takes place on the weekends! What’s your favorite earring style? Show me yours!